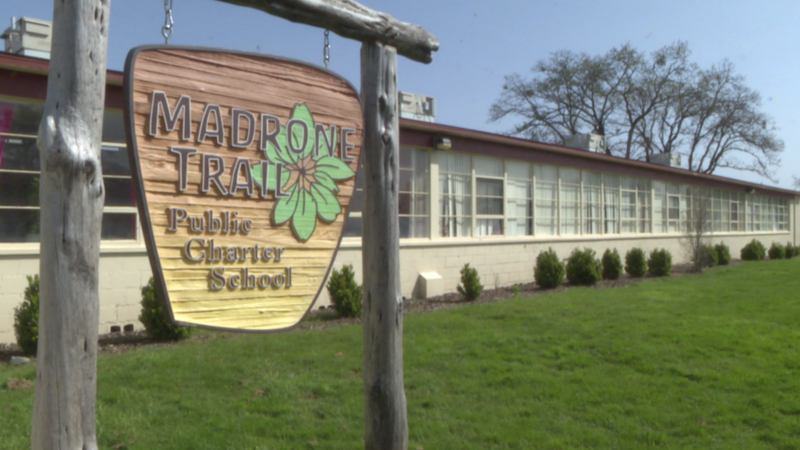 The Madrone Trail Public Charter School is a public charter K-8 school that has been open in the Medford, Oregon school district since September 2007. The plan set out by the founders of this school was to create a kindergarten through 8th grade school. Madrone Trail started as a kindergarten through second grade school located in very small quarters near the YMCA. In the Fall of 2010 MTPCS moved into its new campus. The purchase of the facility was made possible by a generous contribution and loan provided by a benefactor. Ongoing support of donations of work and funds by parents and community members has enabled Madrone Trail to grow and thrive. Each year, we have added a grade, and in 2013 reached our full kindergarten through 8th grade school size. As a public charter school, there is no tuition and the school is open to anyone residing in Oregon. If demand exceeds spaces, preference is given to students residing within the Medford School district. Madrone Trail adapts Waldorf educational methods to public education. The school features parent and community participation at all levels, including governance. At Madrone Trail, movement and the arts are not add-ons to a predominately cognitive approach, but are integrated fully into all aspects of teaching. The inclusion of heart and hands is more than a technique for enlivening academic instruction. In a three-fold approach, the heart and the will, as well as the head, are the subjects of educational endeavor. In other words, the arts are not merely a means to an end– improved academic performance-but an end in themselves. To educate the feelings is to edify and refine the emotions so that they are sensitive and responsive to beauty, truth, and goodness. To educate the will is to build a foundation of inner strength leading to a life of conviction and purpose. Our vision is to develop balanced, successful, socially responsible and contributing community members by introducing a high quality choice in public education using Waldorf-inspired methods, a well-rounded and proven curriculum addressing the needs of the whole child. – A balanced education to nurture the development of the whole child, encouraging each child to become a life-long learner and a benefit to the society. Using a Waldorf inspired curriculum and teaching methods, the school places equal emphasis on a solid academic foundation, academic excellence, artistic expression, attention to the inner emotional life of each child, social development and responsibility, and physical fitness. – Professional enrichment and growth to teachers through acquisition and mastery of an innovative and holistic pedagogy and professional empowerment through opportunities to participate in the creative implementation of the curriculum. – Opportunities for parents to be directly involved in the school operation and make significant contributions to their children’s educational environment. – Opportunities for the community to contribute in shaping the future of the youngest members. If you have questions or are interested in serving on the board email us here. Read all grades teachers bios here by selecting a grade or subject. Cori Royer was born and raised in San Diego, California before going off to college at the University of California, Santa Cruz. There she graduated with a degree in Art with a concentration in Photography and a minor in Education. She continued her migration north, getting her teaching credential at Humboldt State University in Arcata, California. After graduation, she spent two years in the Straight Up! AmeriCorps program, assigned to a local school where she worked one on one with students in the classroom, ran organized games at recess, and helped at the after school program. During that time she met her future husband, and after finishing the program moved with him to a tiny town near Garberville, California, deep in the redwood forest. There she got a job at a small, rural, private Waldorf-inspired school as a class teacher in a mixed grade classroom. The school was off grid and had solar power, a back-up generator, composting toilets, no cell service, and a wood stove in each of the two classrooms at the school. She would have to chop kindling and start a fire each morning in winter before the children arrived. She also taught all the subjects, since there were no specialty teachers other than a volunteer parent to teach Spanish. She taught there three years before getting married and moving to the Rogue Valley to be closer to her husband’s family. In 2011, Cori came to Madrone Trail as the Games teacher when her daughter was 10 months old. A few years later she had her son, and after a brief maternity leave babywore him while teaching the rest of the school year. In June of 2018, she took over as Interim Director and is now currently serving in that capacity for the near future. In her free time, Cori enjoys hiking in the forest, knitting, making quilts, reading, and spending time with her family. Daena grew up in Burbank, California. She has always loved movement, folklore, poetry, cooking, gardening and all of the creative arts. She currently sings with the Southern Oregon Threshold Choir and the Rogue Valley Peace Choir. Daena started working as a math tutor in High School at the request of her teachers, and then worked as a kindergarten assistant while attending UCSB. She completed her BA at Cal State University, Northridge studying Anthropology with the renowned folklorist Beth Hawes Lomax, and completing a minor in psychology. Her first full time job was at a home for children where she taught music, movement, and arts and crafts; and met her husband. After having three children, she became an ordained minister of the Universal Worship, a nondenominational practice that honors wisdom traditions from around the world, and a leader of The Dances of Universal Peace. In addition, she became an award-winning professional textile artisan making children’s clothes. Daena completed her Waldorf Teacher Training in 1984 which included training for the Extra Lesson with Audrey McAllen. She met Jaimen McMillan, and completed the Level I Spacial Dynamics, and Level II Spacial Dynamics Movement Therapy trainings. She was asked to develop the Remedial Education Teacher Training at Rudolf Steiner College (RSC), based on the Extra Lesson, and taught remedial education, movement, and form drawing to teachers and students for 15 years at RSC, as well as giving lectures and workshops at local, national, and international conferences. Completing her State Credential at Chapman University, she worked as an Educational Specialist at a public home school charter for 9 years while she continued her work with RSC, mentoring Waldorf teachers, and doing support work with Waldorf students. During her 35+ years in Waldorf, she has served as Kindergarten, Class, Handwork, Music, PE, Form Drawing, and Support teacher. She greatly enjoys working with students with learning challenges, helping them release blocks, and build confidence and learning skills.